Today Japanese Akoya pearls are some of the most appreciated types of pearls that a woman can buy and wear due to their immaculate quality. A white Japanese Akoya bracelet will make a very luxurious and elegant accessory for any woman to own. The inclusion of a very delicate clasp helps to further enhance the beauty of these items of jewellery. They are also very versatile as their simple design means they can be worn with a wide array of different outfits from casual to more formal and elegant attire. 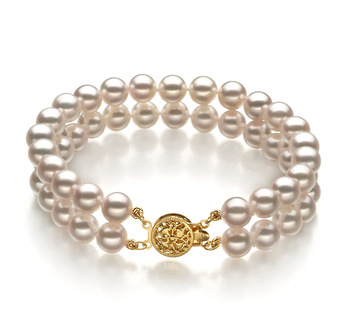 Once on such a bracelet will help to enhance the beauty of the wearer as it brings out subtle tones in their complexion. As you look at our collection you will see two kinds of Japanese white Akoya pearl bracelet on offer. But how do you know which is the best one for you to wear? Well, we offer some advice below you may find useful. These kinds of bracelets look very stylish in a very subtle way. When you wear a single strand white Japanese Akoya bracelet on your wrist it will help to further accentuate the sophistication of the outfit you are wearing. Even when worn with more simple attire it will help to give the whole ensemble a more polished and professional look. This is the kind of jewellery that wouldn’t look out of place when worn to work or going out for dinner with your partner. A very stylish accessory for you to wear to a business meeting or to a party. Such a bracelet will look stunning whether you choose to wear yours with a strapless little black dress or with a short-sleeved blouse. 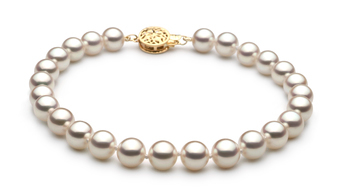 The medium sized pearls used in our collection look very distinguished without overwhelming even tiny wrists. The addition of a very intricately designed clasp helps to make such a more statement piece of jewellery that women of all ages can wear. 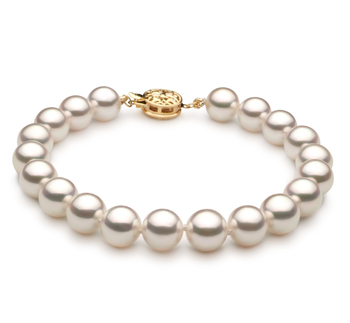 A white Japanese Akoya bracelet would make a lovely gift to present to someone on any of the following occasions. Anyone of our bracelets is suitable for young ladies and more mature women to wear. They really do make a great gift to present to someone on their birthday. A single strand bracelet is ideal for teenagers, which they can pair with more casual fun outfits. Whereas more mature women would love to receive a double strand white Japanese Akoya bracelet that comes with larger pearls. This will really look amazing when they wear it with a business suit or a simple cut dress. It would even look stunning when they choose to team it with more casual attire for lunch with their girlfriends. The bride to be would be thrilled to be presented with such a beautiful gift on what will be the most important day of her life. Whatever design you choose from our collection a Japanese white Akoya pearl bracelet will add another touch of elegance to the bride’s whole ensemble, as well as help their natural beauty to shine out more. As these pearls come in various shades of white and cream finding one that will really complement the bride’s outfit shouldn’t prove a problem. Plus the simplicity of the designs in our white Japanese Akoya bracelets means that they will be able to wear anytime they want in the future. So each time they put it on it will help to bring back wonderful memories of such a lovely important day in their life.